We are a leading Manufacturer of strapping roll and fully automatic strapping roll from New Delhi, India. 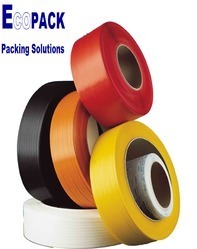 Banking on the individual requirement of the clients, we deliver quality approved a range of Strapping Roll that is delivered in standard sizes and ensures wide usage. Offered range is treasured among the client for its dimensional accuracy and high strength. Offered catalog is extremely light in weight and can be easily carried from one place to another. Additionally, we deliver them within budgetary limits. In order to meet diverse requirement of the clients, we deliver a wide range of Fully Automatic Strapping Roll that is treasured among the clients for immaculate quality and portable nature. Our entire catalog is delivered in varied capacities and dimensions and is fabricated with good quality material. Additionally, our entire range is delivered in standard sizes. Fully Automatic Strapping Roll is available at reasonable rates.